This seminar critically explored the theoretical, cultural, political-economic, and gendered dynamics underwriting the histories and futures of Indigenous new media. A key focus was examining the ways in which new media and digital storytelling connect to and support key issues in the field of Indigenous studies, such as sovereignty, self-determination, decolonisation, and land rights. 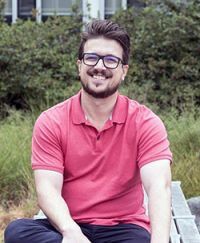 David is a settler scholar and Instructor in the First Nations and Indigenous Studies Program at the University of British Columbia. His research focuses on the ways in which Indigenous artists and programmers are deploying new medias towards resurgence and decolonisation. David is the co-editor of Read, Listen, Tell: Indigenous Stories from Turtle Island and the editor of Sôhkêyihta: The Poetry of Sky Dancer Louise Bernice Halfe. His first monograph is currently in production with UBC Press.